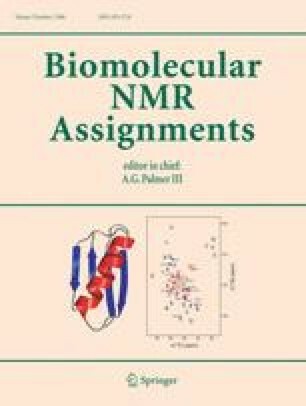 Sequence-specific NMR assignments of the globular core comprising the residues 1066–1181 within the non-structural protein nsp3e from the SARS coronavirus have been obtained using triple-resonance NMR experiments with the uniformly [13C, 15N]-labeled protein. The backbone and side chain assignments are nearly complete, providing the basis for the ongoing NMR structure determination. A preliminary identification of regular secondary structures has been derived from the 13C chemical shifts. We thank Jeremiah Joseph, Vanitha Subramanian, Benjamin W. Neuman, Michael J. Buchmeier, Raymond C. Stevens, and Peter Kuhn of the Consortium for Functional and Structural Proteomics of the SARS-CoV for providing us with samples of nsp3(1066–1226) for the initial NMR screening. This study was supported by the NIAID/NIH contract #HHSN266200400058C “Functional and Structural Proteomics of the SARS-CoV” to P. Kuhn and M. J. Buchmeier, and by the Joint Center for Structural Genomics through the NIH/NIGMS Grant #U54-GM074898. Additional support was obtained for P. S., M. A. J. and B. P. through fellowships from the Spanish Ministry of Science and Education, the Canadian Institutes of Health Research, and the Swiss National Science Foundation (fellowship PA00A-109047/1), respectively, and by the Skaggs Institute for Chemical Biology. Kurt Wüthrich is the Cecil H. and Ida M. Green Professor of Structural Biology at TSRI.